(注釈５） Present level of global warming is defined as the average of a 30-year period centered on 2017 assuming the recent rate of warming continues. A2. Warming from anthropogenic emissions from the pre-industrial period to the present will persist for centuries to millennia and will continue to cause further long-term changes in the climate system, such as sea level rise, with associated impacts (high confidence), but these emissions alone are unlikely to cause global warming of 1.5°C (medium confidence). B1. Climate models project robust（注釈７） differences in regional climate characteristics between present-day and global warming of 1.5°C,（注釈８） and between 1.5°C and 2°C. These differences include increases in: mean temperature in most land and ocean regions (high confidence), hot extremes in most inhabited regions (high confidence), heavy precipitation in several regions (medium confidence), and the probability of drought and precipitation deficits in some regions (medium confidence). （注釈７） Robust is here used to mean that at least two thirds of climate models show the same sign of changes at the grid point scale, and that differences in large regions are statistically significant. （注釈８）Projected changes in impacts between different levels of global warming are determined with respect to changes in global surface air temperature. （注釈 11） References to pathways limiting global warming to 2oC are based on a 66% probability of staying below 2°C. D1. Estimates of the global emissions outcome of current nationally stated mitigation ambitions as submitted under the Paris Agreement would lead to global greenhouse gas emissions18 in 2030 of 52–58 GtCO2eq yr-1 (medium confidence). Pathways reflecting these ambitions would not limit global warming to 1.5°C, even if supplemented by very challenging increases in the scale and ambition of emissions reductions after 2030 (high confidence). Avoiding overshoot and reliance on future large-scale deployment of carbon dioxide removal (CDR) can only be achieved if global CO2 emissions start to decline well before 2030 (high confidence). D4. Mitigation options consistent with 1.5°C pathways are associated with multiple synergies and trade-offs across the Sustainable Development Goals (SDGs). While the total number of possible synergies exceeds the number of trade-offs, their net effect will depend on the pace and magnitude of changes, the composition of the mitigation portfolio and the management of the transition. (high confidence). D6. 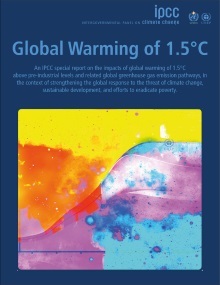 Sustainable development supports, and often enables, the fundamental societal and systems transitions and transformations that help limit global warming to 1.5°C. Such changes facilitate the pursuit of climateresilient development pathways that achieve ambitious mitigation and adaptation in conjunction with poverty eradication and efforts to reduce inequalities (high confidence).